Pallas/Ethics: There is a wide quincunx between Pallas and Pluto -- an authoritarian factor but quite weak. This is overwhelmed by the libertarian factors. Pallas is conjunct the North Node and the Sun, and ruled by Jupiter which is conjunct the North Node, the Sun, and Mercury (all three Pallas-positive factors are present). Venus/Economics: Venus is in Aquarius, ruled by Saturn (which is opposite Neptune) and Uranus (which is sesquiquadrate Neptune). 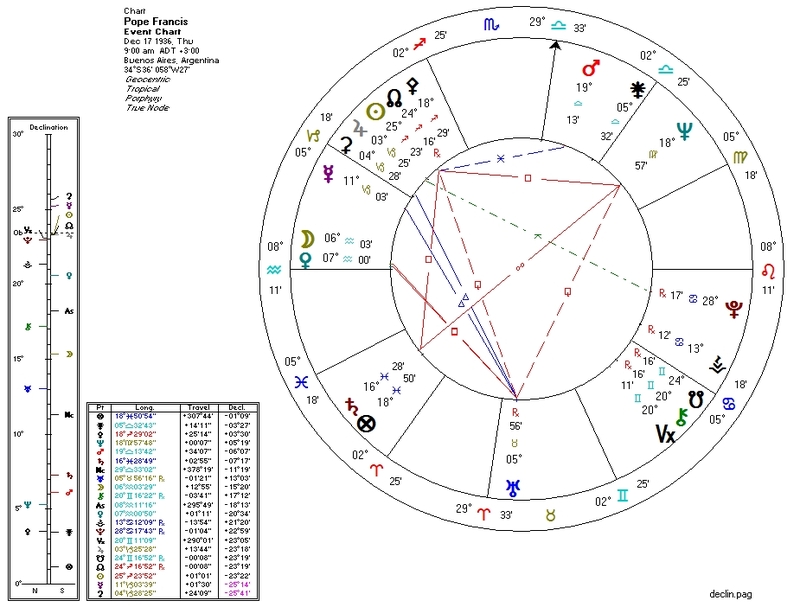 Neptune alters both Venus' rulers and no capitalist factors are present, making for a clear economically Leftist chart. While Left-wing economics are lethal in the charts of politicians (who enact policies that quite literally kill people by wrecking their economies), they are absolutely appropriate in the charts of spiritual leaders. Moon/Fourth-House/Culture: The Moon here is affected by the exact same Neptune factors as is Venus. In addition, the South Node is in the Fourth House: Francis is the opposite of a cultural conservative. This is a fascinating shift for an institution known for adhering to arguably outdated dogma. The Vatican's College of Cardinals probably couldn't have a elected a more appropriate figurehead for today's times. Pope Francis may help the Church to remain relevant in an age of State-worship, and remind us all that right and wrong do not come from the barrel of the government guns, but from a higher authority. Unfortunately, the Pope's Pallas has progressed into an opposition with his Pluto, possibly accounting for his public views on forced wealth redistribution and drug legalization.